› Author AffiliationsThis work was supported by the National Research Foundation of Korea (NRF-2012M3A7B4049645 and 2014R1A5A1011165 with the Centre for New Directions in Organic Synthesis). 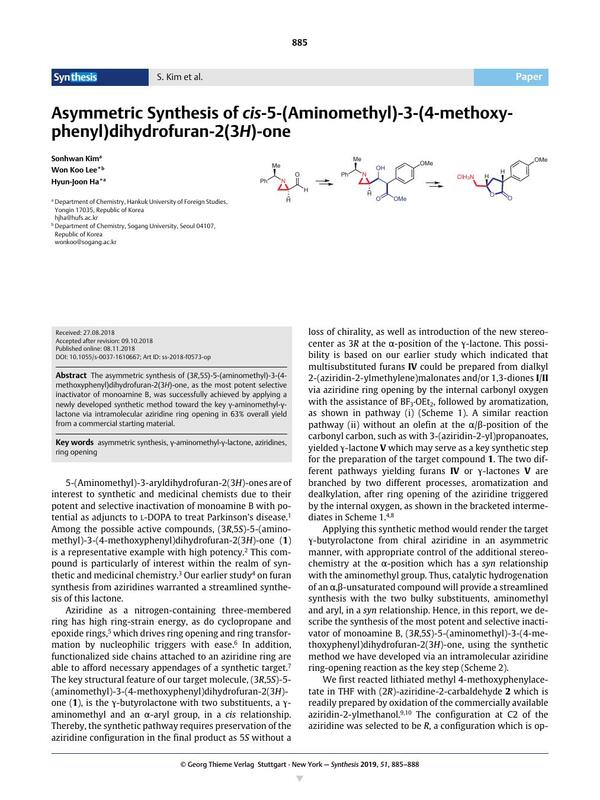 The asymmetric synthesis of (3R,5S)-5-(aminomethyl)-3-(4-methoxyphenyl)dihydrofuran-2(3H)-one, as the most potent selective inactivator of monoamine B, was successfully achieved by applying a newly developed synthetic method toward the key γ-aminomethyl-γ-lactone via intramolecular aziridine ring opening in 63% overall yield from a commercial starting material. Supporting information for this article is available online at https://doi.org/10.1055/s-0037-1610667.